Many wild animals that have been captured and submitted to the pet trade can be given their fair opportunity to live and die in their natural habitat, instead of a cage. 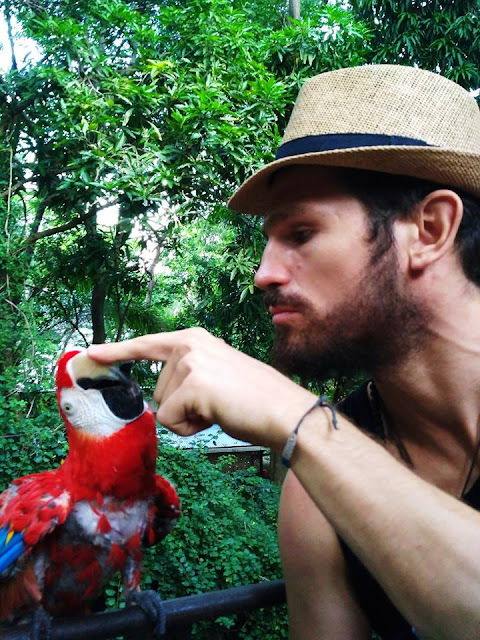 Over the last decade, we have participated in the return to the forest of parrots, toucans, squirrels, monkeys, owls, doves, among many other animals. We have also provided a kind of hospice for lots of wild animals that were mortally injured, almost always as a consequence of some kind of human-wildlife conflict. Many times, these conflicts have been non directly intentional. Other times, conscious intent to harm or at least use harmful force against some wild animal occurred. Wild animal rescue may be needed for any of several, different reasons. 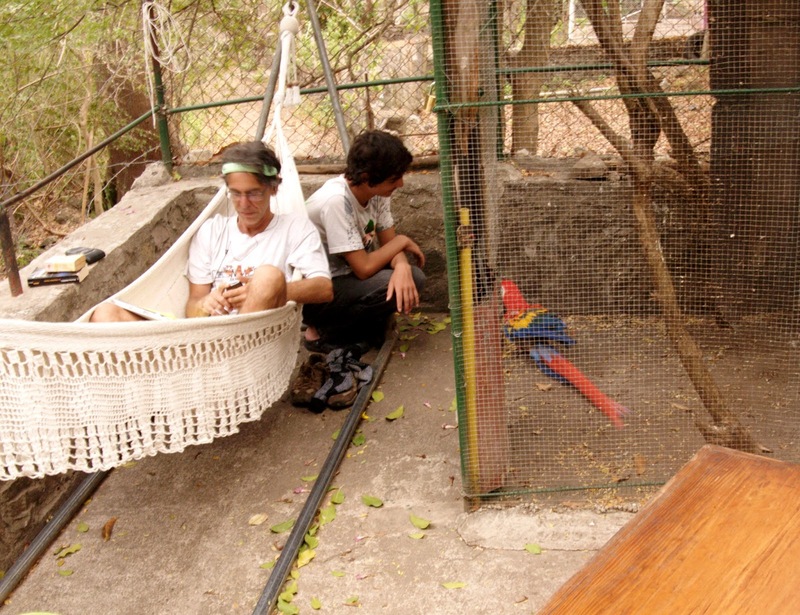 Midorna, a Scarlet Macaw, is a long-term resident of Estacion Biologica Laguna de Apoyo. Photo Andras Dorgai. One of the ways wildlife encounter conflict with humans is because of the pet trade. Almost any animal can be found for sale on the side of the road at likely locations, many of them offered as pets, others as meat. 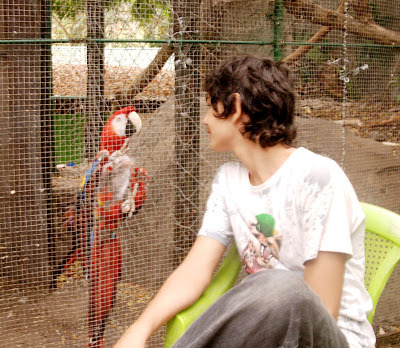 A few species of animals in Nicaragua, however, are overwhelmingly victimized by the pet trade. One of those species is the Scarlet Macaw (Ara macao). New blood feathers, still covered in sheaths, are emerging along the neck of Midorna. Photo Andras Dorgai. 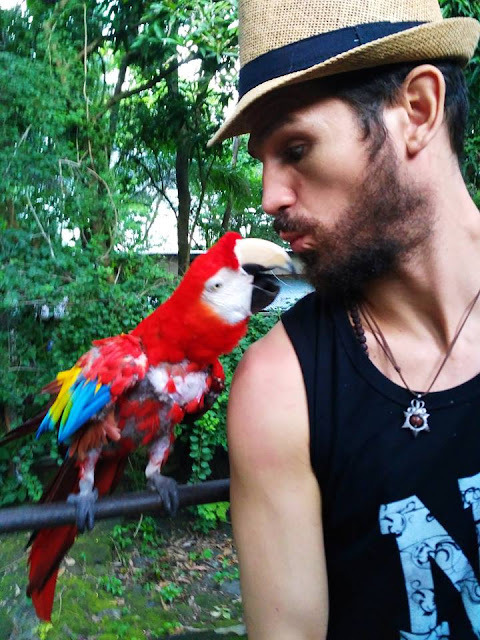 The Scarlet Macaw was first listed in Appendix III in the list of protected species of the Convention on International Trade in Endangered Species (CITES), in 1976. Its status was elevated to the more restrictive Appendix II in 1981, then to the most restrictive category for international trade, Appendix I, in 1985. In spite of this listing, the subspecies found in Mexico and Central America, Ara macao cyanoptera, has continued on a precipitous decline in wild populations. They had disappeared from El Salvador in the wild by 1987, and today in Nicaragua, fewer than 100 individuals are found in the wild, thanks principally to the pet trade. For the few who earn her utmost trust, Midorna can be quite a playmate. Photo Andras Dorgai. Midorna is a female Scarlet Macaw that has lived a fairly typical life for its species in Nicaragua. There has never existed a macaw hatchery in Nicaragua, so she, like all the others of her species in captivity, were once wild animals, flying free over forests and fields. Because Scarlet Macaws fly above the canopy, and make tremendous rackets while flying, they do not go unnoticed, making their presence-and their absence-conspicuous. 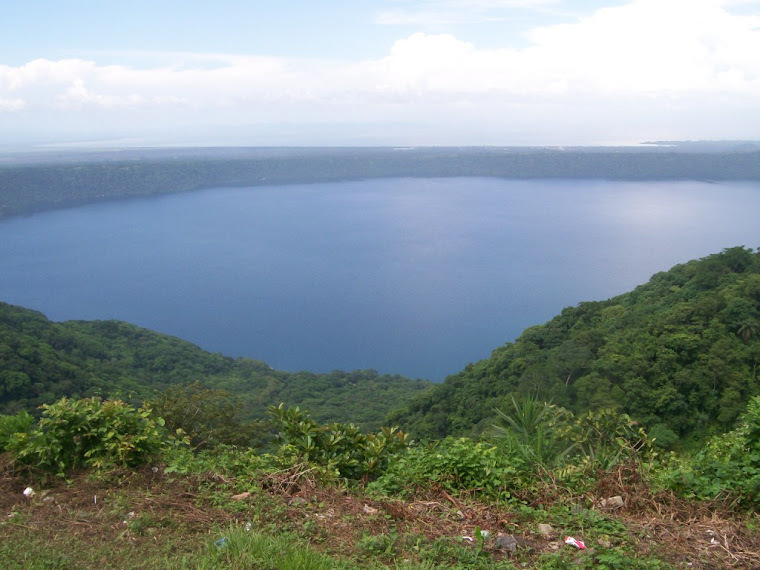 Until 1983, several individuals that roosted in the Chiltepe Peninsula would routinely fly over Lake Managua to reach the capital, where they were easily observed. 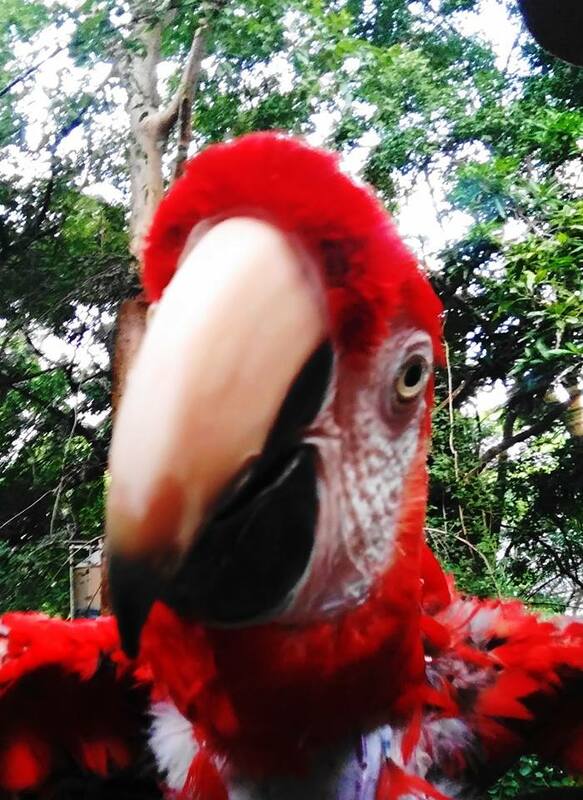 Likewise, the last corroborated accounts of the Scarlet Macaw in the villages around Laguna de Apoyo were from 1969, where they were regarded as potential sources of income for those who could catch them for the pet trade, and as pests by farmers whose corn could be decimated quickly by a flock. Although we don't know her age, Midorna is evidently decades old already. Midorna craves attention and loves especially the company of males. Photo Andras Dorgai. 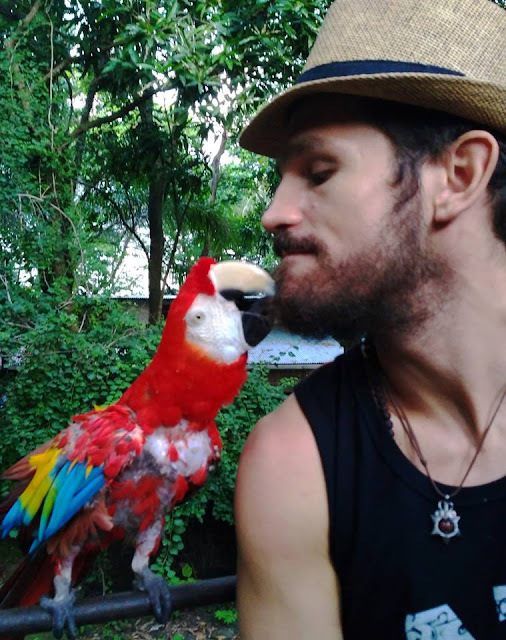 The pet trade has meant for Midorna, and for hundreds of other Scarlet Macaws in Nicaragua, a lot more than the tragedy of passing decades of her life in cages instead of the wild, where she belongs. During her capture and handling, or more bones in one of her wings was broken, leaving her absolutely incapable of flight. She knows perfectly well that nature gave her wings to fly, yet she cannot fly, or even make a soft landing if she falls from a height. She has been codemned to a flightless life in her conscious being, albeit she surely flies in her dreams. She loves to raise her wings and feel the wind in them, and to observe below from a high perch. Midorna and her special friend. The majority of the red feathers that should provide a complete covering over her breast have been plucked by her. Photo Andras Dorgai. Prisoners go mad when faced with extreme boredom in their incarceration. It should not be any surprise that a Scarlet Macaw would also react poorly to years in a cage. Boredom and isolation are guaranteed. Midorna has developed a behavioral disorder involving breaking and/or plucking her feathers. This disorder is chronic and recurrent: her feathers periodically regrow, only to be broken or plucked again. Even if she were to fly, this disorder would make her life in the wild impossible. Midorna benefits from company, and becomes visibly happier with more interactions. Photo Andras Dorgai. In these ways, not only has her life been robbed of years; her sentence for captivity is lifelong, and her own behavior is now plagued with pernicious actions that prejudice her own happiness. 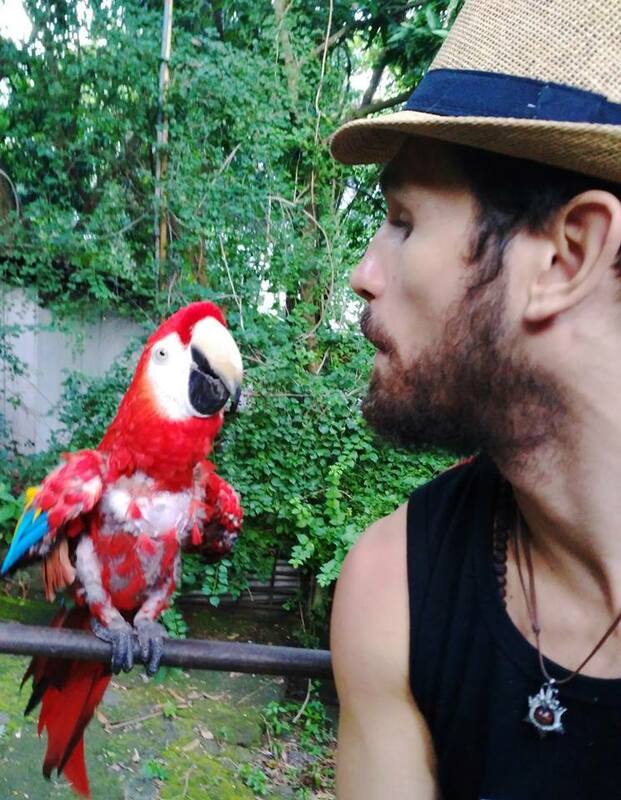 These issues are extremely common among macaws in captivity. 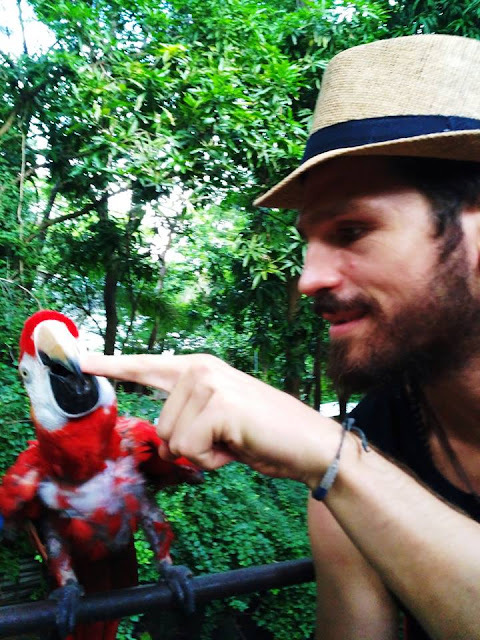 The Scarlet Macaw is no longer seen in the wild, almost anywhere in Nicaragua. Photo Andras Dorgai. There are many issues at stake with what to do with Midorna. First and foremost, is the issue of the integrity of the wild populations that currently exist in Nicaragua and the region. If there is any way that Midorna's life can contribute to the healing and recovery of a stable, continuous, wild Scarlet Macaw population, then she should be at its service. There are many, many Scarlet Macaws in captivity throughout Nicaragua, and they could be placed into a captive reproduction program with the intention to create a new generation for release into the wild. Unfortunately, releasing Scarlet Macaws supposes a safe place for them to be released, which effectively does not yet exist. First, we need to create the conditions which discourage people from capturing them in the wild. At the moment, those conditions do not exist. So, Midorna is waiting. Not just anyone would risk a kiss from Midorna. 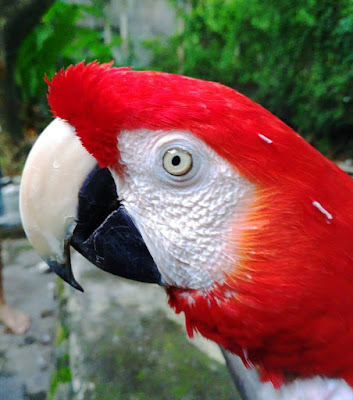 As a Scarlet Macaw, she has powerful mandibles that could rip flesh with ease. Photo Andras Dorgai. 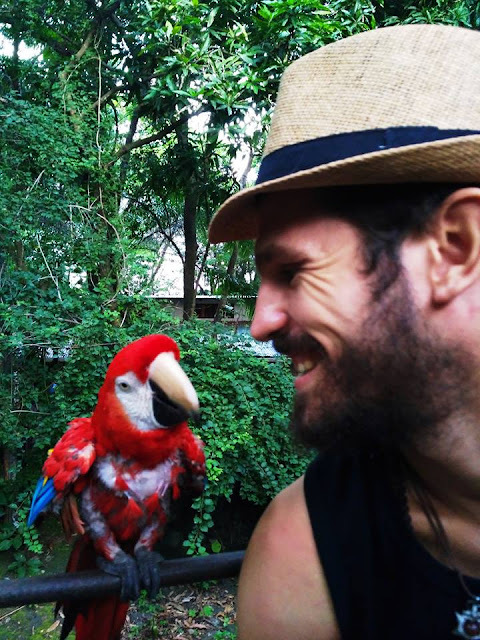 Midorna can help to create the conditions for a future with Scarlet Macaws once again flying overhead in Laguna de Apoyo and similar areas. She is an ambassador for her species, for the tragedy of the pet trade. Nicaraguans and foreigners alike get to hear her story and contemplate the issues that are behind her condition. More is needed to change the tide, however. 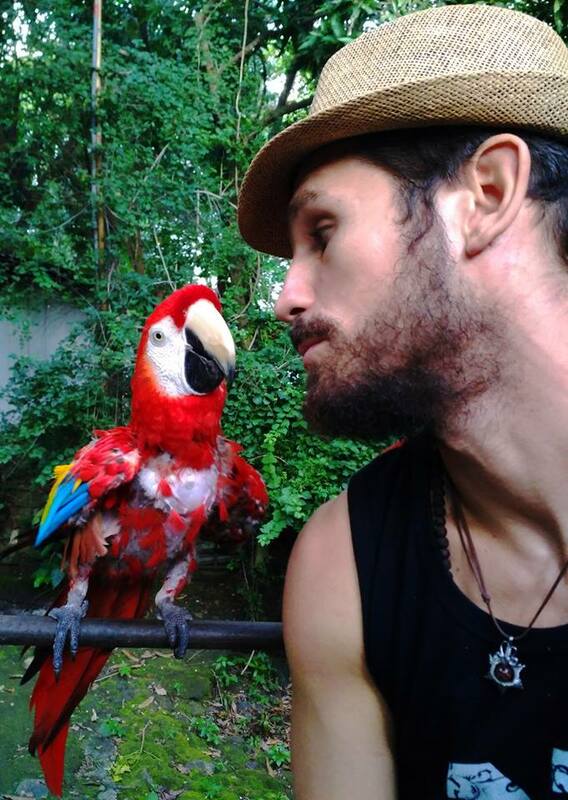 The role of the Scarlet Macaw in wilderness policy in Nicaragua is the story that Midorna has to tell others. Photo Andras Dorgai. Research, conservation policy advocacy, and education on the pet trade in wild animals are still needed in Nicaragua in a big way. You can help. First of all, don't buy wild animals as pets. Make your opinion heard among your friends. Second, get involved. Volunteer your time to care of wild animals, donate your spare change to help feed and care for them, or join us for a study of the issues behind the pet trade. Contact us at GAIA if you are interested! Beards are a special attraction to Midorna. 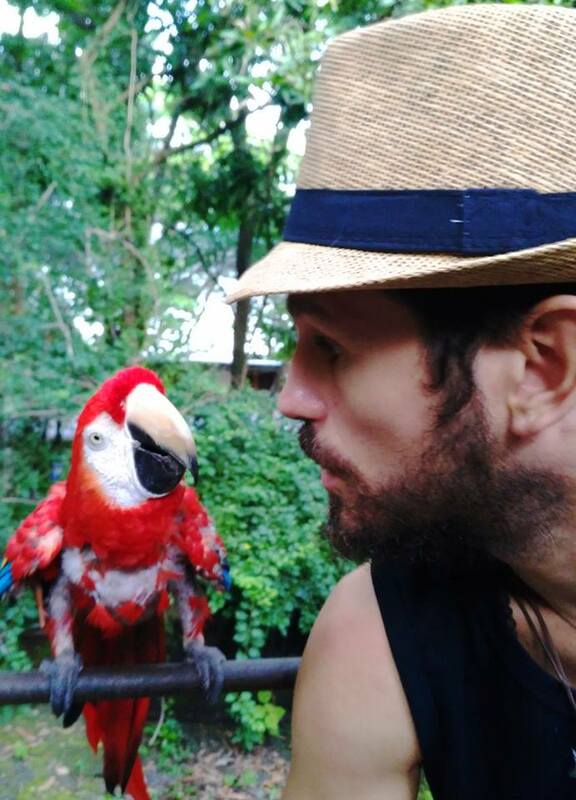 Our goal is that she is the happiest Scarlet Macaw in the country, because liberty is no longer an option. Photo Andras Dorgai. Midorna loves attention, particularly from boys. Photo Jeffrey McCrary. Midorna having an intense conversation. Photo Jeffrey McCrary.